Volca Keys, Analog Synth from Korg in the Volca series. Brandski's review (This content has been automatically translated from French)" cute but good!" I, unwanted as qu'expendeur because let's face it claver ribbon is just impossible to use. I the driver from an external MIDI keyboard with a syncro tempo by an external sequencer. The MIDI implementation is complete, everything is controllable (except peak VCF). very simple to use and the little manual is clear. Once the stuff we got it out sounds good but a little weak. I do pass through a chain of compression / reverb / delay to give it more body. nice to add a layer of synth to techno or electro. The range is wide octave, little is even out of the bass. The integrated delay is zero. I utlise externalities. Bullet points: jacks 3.5 ", the Auxiliary input abscence to chain multiple volcas without mixer when you are traveling, and the size of the loop sequencer, 1bar is vraiiment very little! A big plus for the filter, with a good round even in subs resonance, which allows to draw lines satisfying bass with a little hack. revega's review (This content has been automatically translated from French)"Modern Stylophone." Korg now for a moment seems to take the least possible risk and product at a good pace, myriad devices more or less successful. 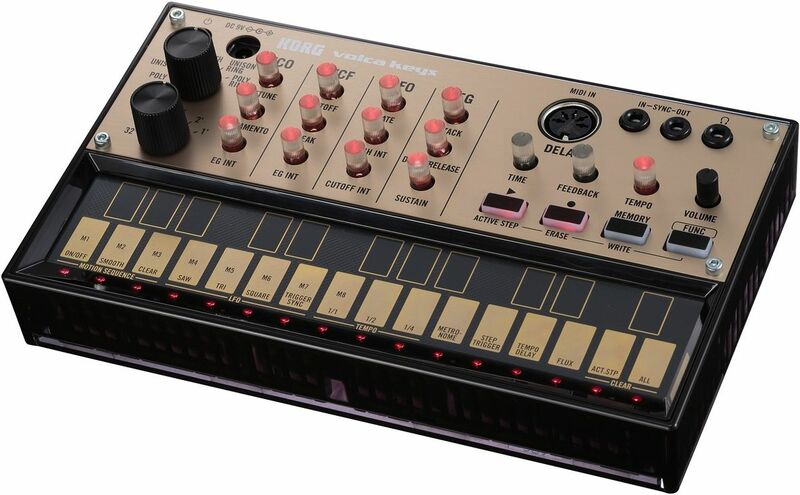 The Volca Keys is one of three proposed by the brand last series, and the most successful (Beats and Bass are not convinced me at all). Note! The VolcaKeys has a MIDI IN (phew!!) And Sync in & out. Rather well built, compact and lightweight. 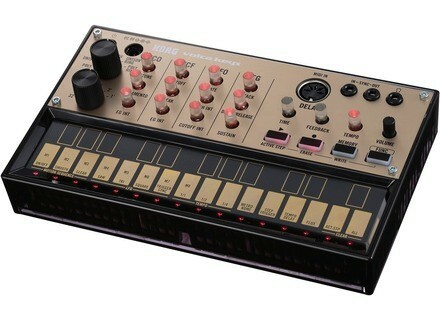 Do not forget this is a synth to 135 €. The fact that the KVK can run on battery makes it a nomadic and built for the road (easy to fit in a bag). The &#39;speaker&#39; to stay around anecdotal because cacophonous. FYI the machine also works via a 9v adapter (Personal I plugged a lambda transformer and it works very well), but they include 6 batteries in the box in compensation. At least you can play when unpacking. The configuration is simple as looking like a 80&#39;s calculator. Access to the various functions is quite easy and requires no further knowledge than that of subtractive synthesis (well I say that but if it is there that pain). The keyboard on this one, quite well done and solid (nothing to do with this horror Monotribe). Good spaces are tight but we manage to play without putting too much &#39;pain&#39;. Finally play it quickly said, two fingers no more. The manual is quite clear and requires little reading to find his bearings in particular with the FUNC (access submenus button). * Small info for the sequencer, in passing the FUNC + ALL clears the outstanding sequence and FUNC + CLEAR erases automations. The only edition of the sequences is very easy. In short, as always, Korg is in the simplicity and better. Now what about the sound? A strength to ride the silly mode &#39;analog&#39; and we serve as the ultimate Holy Grail we will be attentive to Kog Volca analog Keys. Already the unit requires no warm-up time to stabilize so that&#39;s a good point. In a few seconds you have access to all parameters and its very distinctive Korg then appears. 3 OSC (not independent) do not bring that presence can be assumed. Only focused on two waves, square and sawtooth limitation is clearly displayed (frustrating). The knob dedicated &#39;VOICE&#39; allows to vary their position and in a case of giving a false polyphony (or rather paraphonie) 3 ways to Volca (interesting but not transcendent). However, we can fall back on the Detune function to give a little body-oriented bass settings. The VCF (12dB) is honest but the knobs make it very sensitive, he finally fulfilled its role properly. Its cloning with Minikorg 700 to bless, for once Korg tied rehashing not just another clone of their damn MS20. The LFO (3 waves this time) is when his fortunately well placed and responsive, successful enough to linger. Its use is very pleasant and gives good results. The envelope ADS is also very responsive and sharp. Brief on all these fronts Korg worked well and on a machine of this size and this price it is exemplary. It goes fast, very quickly became disillusioned with the delay and sequencer. Patatra is disastrous at best. It blows, it generates bad resonances and sound then passes from the box &#39;usable&#39; to &#39;help!&#39;. Some typical settings FX the delay is tolerable for the rest, to banish. The sequencer 16 is not a good idea but unfortunately too short. The Metronome, meanwhile does not really keep pace. Function becomes draft is made up to the approximate damage. There or VK is interesting is at its lead. I found it nice on this point, nothing revolutionary, let&#39;s clear, but there is a retro feel (vintage to trendy and selling) related to the Minikorg 700s filter. With good effect rack he made his impression if so. In fact on this point should be clear. The KVK is not a standalone tool at all. For aficionados of the &#39;cricuit bend&#39; can be for other drop. Without a computer interface equipped with effects and a master keyboard you will struggle to take full advantage (already limited) machine. We should also mention the very low level of output (with headphones is ok) as soon as we pass on a mixing desk or any sound card. Verdict: A decent sound, very distinctive, minimalist therefore has limited use without the internal delay and with some external tools to give it a little safe (compressor, EQ, reverb, delay etc. ..). I&#39;ve had a few days after trying without really believing in a store. I found it very nice and especially for not very expensive I have a portable generator interesting that allows me to make models to removal without turning an entire studio. Their previous Monotribe was so appalled me that Korg had, from my point of view, much more credit on property occupied by more adventurous and inventive brands (SDI, Analog Solutions, Moog, Vermona, Elektron market etc. .. .). The re-release of their MS20 was only confirmation of their former glory. There with a machine at 135 € Korg an interesting point in the field of micro-machines laptops, a sort of reminiscence of the Stylophone. But honesty compels me to say that the KVK to rest my eyes a camera &#39;prototype&#39;. Certainly well finished and accessible but still a prototype. When, for just € 100 more Waldorf offers us his Rocket (ok without keyboard or seq ° and effects) and slightly above Arturia and Micro-Brute, it remains pensive on possible perspectives. We are surprised to see a further development of the KVK, with more consistent dimensions (grip and knobs), VCO separable, extensions modulations (a matrix ISD), memories, patches, interfaces etc. ... In short a real synthesizer that makes new with new. The price will be accordingly but Arturia seems to have understood with the range of &#39;Brute&#39; that a good size market share. The Keys Volca do is maybe the beginnings, we really hope, the beginning is promising. Thé-aux-Rems's review (This content has been automatically translated from French)" Stunning!" It has a compact and mobile ultra synthesizer comprising CSO 3 in parallel with a filter and an envelope generator LFO. It accepts MIDI (in) and has a built-in sequencer 16 (not poor) And I forgot, possibility of automation parameters. Configuration? Super simple for basic functions but it will still take manual for more information on memory and the various functions offered by the machine! The unit is 100% analog so it has a warm and clear sound pretty cool! It'll be three weeks and I can assure you that although I was through with, I test all possible and imaginable settings! I feel quite moog synth, korg or clavia .. I simply conclude: 135 euros was a minimalist analog synth but that is what is asked with a clean sound and sufficient parameters to have fun with! Only downside sequencer 16 not too short for my taste and the LFO passing a very slow frequency has a very fast frequency by turning the knob barely. But as it is used in MIDI (including setting) This is not at all annoying in my use! tristan07's review (This content has been automatically translated from French)" crazy to return the analog to a!" I'm not and do not want to! I'm not a hobbit or lilipucien! mash with a clamp should, surely! looks not too bad with the Electronic now. seems to sound a lot, there's a step squencer more. we just drive by noon. schtroumf why this method? it is unplayable. even if the driver would need a midi control surface with normal knobs. now becomes easier and directly accessible, warm, minimalist somewhere, finally so tiny! the idea is that a back moin chre can be purchase for the customer? Finally it's frustrating not? or I get it. What is the dlire otherwise the crisis logemnent Paris? it will make the tables mixes and pregnant version schtroumf also, why not? no crazy caning for me and I think for many people who will not dare to say anything! Korg is crazy from the jaws of the world, 20 ms mini, but it'll still really what. they make their synths normal size or schtroumf as has everyone will find his account, it's on.